Randy Orton heads to the ring. He wonders if anyone still believes in Jeff Hardy. Orton erased The Enigma, and he will erase everyone else that the people believe in. The Bar discusses stuff as they watch SmackDown. Charlotte tells Becky Lynch that she wasn’t trying to ruin Lynch’s moment. Lynch wants to be happy for Charlotte joining the Summer Slam title match, but she wanted Carmella alone. Regardless, Lynch has no hard feelings. She’ll just have to be that much better in order to win. Good match. It did exactly what it needed to do. The IIconics had a lot of control in the match, but Becky and Charlotte both showed their dominance late in the bout. There was a blind tag towards the end of match that led to Charlotte overshadowing Becky, and that was exactly what The IIconics were talking about on their way to the ring. Will there be animosity between Becky and Charlotte? That’s what this match was hinting at. Renee Young welcomes New Day. New Day says they tried commentary last week, but this week they’d like to try something different. 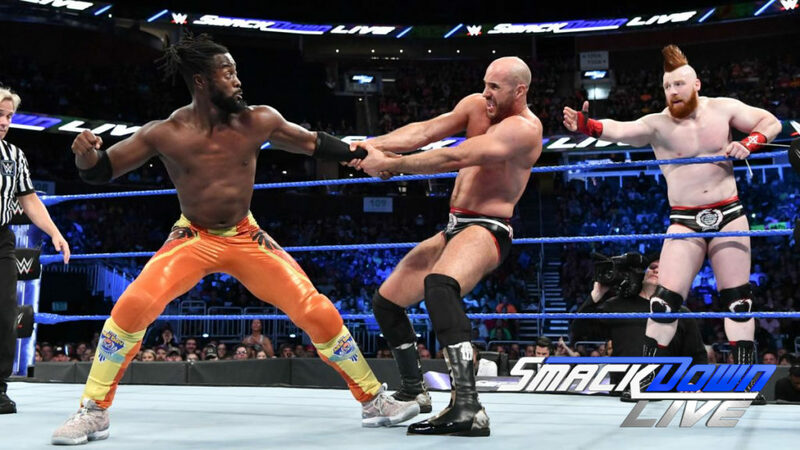 Kofi Kingston puts on a blond wig (and calls himself Kramer Kingdom) and interviews Woods and Big E. New day says they’re going to beat The Bar tonight and the Bludgeon Brothers at Summer Slam. Earlier today, Miz was on the “set” of Miz and Mrs. Miz has decided to give Daniel Bryan the gift of relevancy by facing him in a match at Summer Slam. AJ Styles heads towards the ring area. Becky and Charlotte celebrate their win tonight, but Becky says things are going to be different in two weeks. Last week, Samoa made things personal with AJ Styles. AJ Styles heads to the ring. Responding to what Samoa Joe said last week, Styles says he wants to be the greatest WWE superstar for his family. His wife is basically a single parent since Styles is always on the road, but parents make sacrifices to provide for their children. Styles is pissed at Joe because Joe knows his wife. They’ve been friends for years, but Joe threw it all away by mentioning Styles’ family. Styles says Joe won’t be walking out of Summer Slam as champ, and he’ll be lucky to walk out at all. In the back, Joe is watching and laughing. Rusev tells Lana that she’s right, he should be more supportive. He will be with her at ringside tonight when she has her rematch with Zelina Vega. Aiden English walks up and apologizes for the last few weeks. Rusev forgives him, but says it’s probably better if he stays in the back tonight. A pretty good match. This was fine, but the main point of the match was to show Rusev coming to Lana’s aid, and to have Aiden English crew it up (accidentally) again. At this point though, they might as well reveal that English is doing it on purpose because he’s jealous of Lana and Rusev. The accidents and coincidences are getting to be a bit much. Renee Young welcomes Shinsuke Nakamura. Nakamura says Jeff Hardy was erased. He’ll face what’s left of Hardy and leave nothing left for Orton. R-Truth walks up. Tye Dillinger tries to stop him, but Truth says he wants to face Nakamura for the US Title at Summer Slam. He’ll get that match by doing what everyone else does: pin Carmella. Nakamura says something in Japanese, and R-Truth is offended. In the ring, Byron Saxton introduces The Miz. Miz appears on the tron, so Saxton asks Miz if he’s afraid of Daniel Bryan. Miz doesn’t dignify the question with a response. Saxton then asks if Miz and Mrs will achieve success similar to Total Bellas. Miz says his show doesn’t have any negative reviews on Rotten Tomatoes (because it’s not on Rotten Tomatoes), and he’s not at SmackDown because he’s a big star. Miz suggests that Daniel Bryan should watch Miz and Mrs.
Saxton talks about the history between Miz and Bryan. Miz says that even though Bryan might have obsessed about Miz over the years, Miz has barely thought about Bryan. Bryan needs a match with Miz to be a star, Miz does not need a match with Bryan. Bryan is beneath him. As Miz continues to talk, Bryan attacks Miz. Bryan fights Miz and his two security guards until Miz smashes a vase over his head. A good exhibition for Nakamura. R-Truth put up a valiant fight, but Nakamura had no problems dominating this short match. Earlier today, the Bludgeon Brothers are looking forward to destroying whomever wins the finals of the mini-tag tournament to determine their number one contenders. Fantastic match! The Bar looked dominant for a lot of this match, but New Day kept staying in it and showed tremendous heart and resilience. The action was fast and surprising, and it kept getting better and better as it went along. The Summer Slam match between the Bludgeon Brothers and the winners of this is going to have to to an awful lot to try to top this match. This was so, so good. Despite the seemingly pointless Randy ORton speech at the beginning, this was a good show top to bottom. I’m ready for the English/Rusev/Lana story to move on, but that was maybe the only other thing that I felt could have been better. And I like all of the people involved in that, so I can give it a pass. Super great. Loved it. Again, SmackDown shows that their tag division is light years ahead of RAW’s.